Peace is about bringing us together locally and gobally. Students in public education settings including all public schools, TAFE colleges and other post-school sites are eligible to enter. 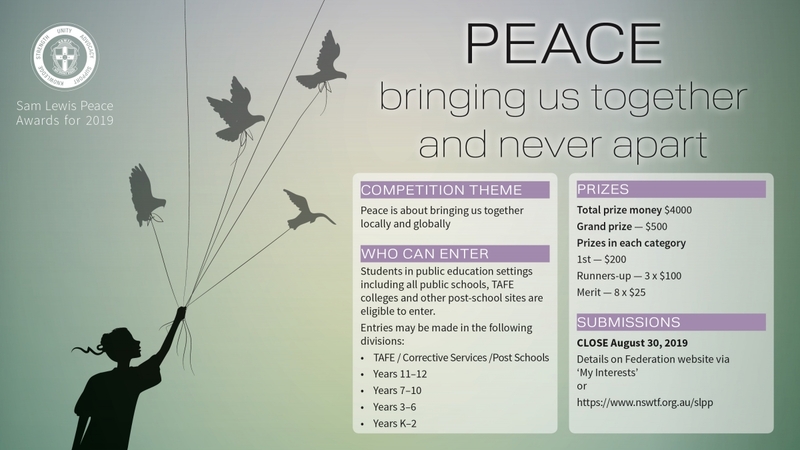 Entries may take many forms, including posters, poetry, short stories, performances or multimedia (Power Point/DVD/video). Also acceptable are entries that depict larger relevant projects that relate to the competition’s theme, for example: special events, special performances and special days. In general, essays should not exceed 1000 words. Performances and multimedia entries should be kept as brief as possible for judging purposes. All entries must address the criteria/theme. Entries will be retained by Federation so please keep a copy of your entry for yourselves. Federation reserves the right to use entries at its discretion including exhibition and publication.